Live music, in its purest forms, provides the proverbial “Great Escape” or Paracosm that Washed Out’s latest LP so precisely and expertly promises and delivers in spades all the way from the outer stretches of the A-side to the end of Side B. Since gaining popularity at such a rapid rate over the past few years on the heels of 2009’s super-buzzed Life of Leisure EP, 2011’s breakthrough Within and Without full-length debut, Ernest Greene has been making strides to get the live rendering of Washed Out up to speed with his unquestionable prowess in the studio. 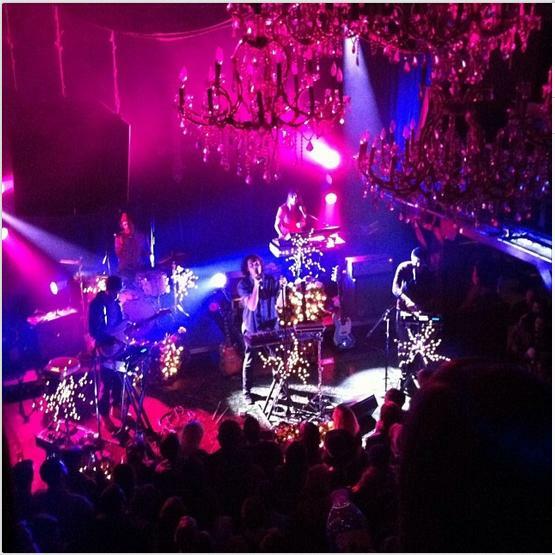 On Friday night, the lengthy Paracosm tour made a stop in the Big Easy for a packed-out Friday night show in the Warehouse District at Republic New Orleans. When there’s an overwhelming general sentiment from the crowd as people file out of a show, chances are it’s an accurate one. After less than 70 minutes on-stage, the show was over and the feeling from overheard comments from friends and strangers was that most everyone was left wanting more. The general sentiment: this concert was good, but just too short. A Great Escape so to speak, and like most vacations and great dreams, just a little too brief. To kick things off, the band walked onto the stage (which looked to be thematically decorated to match the Paracosm album jacket) to the chimes and chirps of the ethereal “Entrance” opening segment from the new record before Greene strummed into a rich, expansive and flowing “It All Feels Right” amongst billows of smoke from the youngster audience. Greene quickly commented on the olfactory overload in the room (even for New Orleans) the first chance he could and the band kicked into the midtempo “New Theory” as we wisened up from the overcrowded floor to an empty balcony for a better vantage point. Songs like the droning “You and I” aren’t likely general fan favorites, but this uniquely synchronized groove had a transfixing effect on the crowd as the floor looked to tuck away their phones for a minute and gain focus on the entrancing music unfolding onstage. Little did we know, once the familiarly bouncy rhythms of “Feel It All Around” kicked in (with an added flourish to the intro, the show was nearing completion. The “hit” song flowed by in a flash and the pulsing “Amor Fati” revved up the weekend crowd to an energetic peak before the band took a pre-encore bow. Returning with a band, the encore opener featured a hallucinatory flash of strobes and synths that managed to quickly warp a few minds down below and up top (yours truly included). Appropriately, an uber-vibrant version of the stirring “Eyes Be Closed,” blanketed its way through all the nooks and crannies of the oddly-shaped venue, closing out a beautiful, yet brief performance. From the bedroom to the Big Easy, the captain of the Washed Out ship Ernest Greene channeled all comers into the magical secret garden of Paracosm, mesmerizing but leaving us only wanting more. Overall: A solid show and more proof that the live presentation of Washed Out delivers and expands upon an already impressive studio output. Another 20-30 minutes and / or a slightly later start would’ve helped lock in the crowd to the kind of levels you’d like to see at a dance and groove-oriented show. All-in-all, great to see the latest live rendering of Washed Out on a Friday in New Orleans. Could be worse.